YOKOHAMA - Hyuma Matsui had a tiebreaking RBI single and drove in two runs, Shun Yamaguchi stifled his opponents over the distance, and the Yokohama BayStars beat the Chunichi Dragons 5-2 on Saturday afternoon. 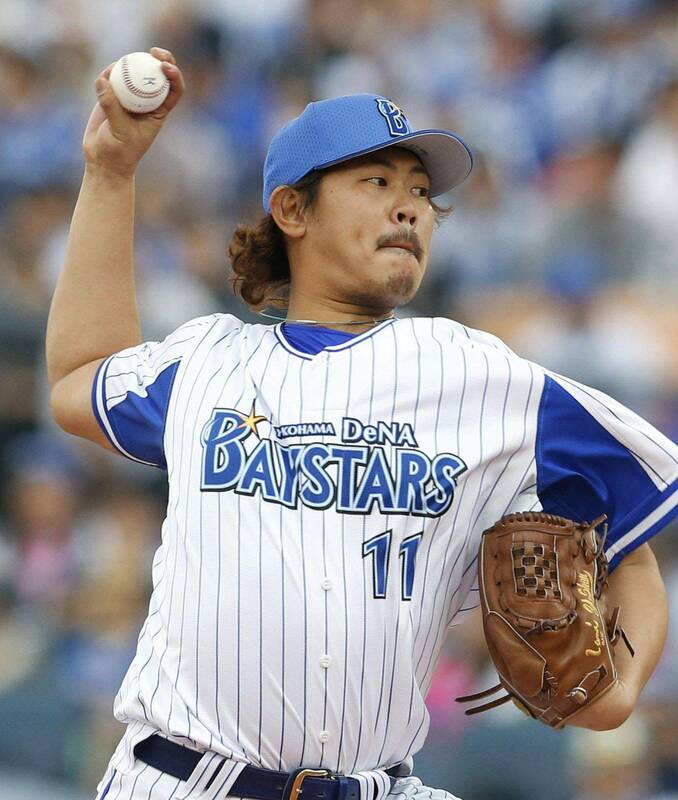 Yamaguchi (3-1) struck out 11 and walked two in a 132-pitch outing in his first complete game of the season, leading the BayStars to their third consecutive win after losing seven decisions in a row. The Dragons got in the driver’s seat early in front of 28,519 at Yokohama Stadium, but it was the quick work of Chunichi starter Raul Valdes that set the rhythm and quelled the BayStars’ offense until a lapse by the lefty in the third. Ricardo Nanita had a leadoff double to left leading off the second and Chunichi was on the scoreboard the very next at-bat, when Shuhei Takahashi doubled down the right-field line to make it 1-0. Yokohama got a chance when Jose Lopez drew a one-out walk in the second, but the first baseman was thrown out by a mile when he tried to reach third from first on Aarom Baldiris’ bloop single to left, and the next batter was retired to end the inning. The game took a twist in the home half of the third with a leadoff blast by second-year man Minei — his first career homer. Leadoff man Takehiro Ishikawa hit a one-out double to left-center and came around on Matsui’s single to right for a 2-1 DeNA lead. “I was just trying to stay calm like in every at-bat and I put a good swing on it,” said Matsui. Minei continued to raise havoc in the fifth and flashed the signs batterymate Yamaguchi wanted when needed. He hit a leadoff double, reached third when Dragons catcher Masato Matsui’s throw pulled third baseman Takahashi off line on a fielder’s choice sacrifice bunt and scored on Hyuma Matsui’s hard-hit comebacker that deflected off Valdes’ glove. Takayuki Kajitani added an RBI double to left for insurance. “Today we were focusing on the fastball from the beginning to the end. We changed based on the situation,” said Minei. “Having four runs early on helped out. 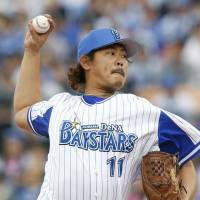 I figured I could go the distance today,” said Yamaguchi, who caught pinch hitter Ryosuke Hirata looking at a fastball for the final out of the game. Kajitani led off the eighth with a single to right off reliever Takuya Asao, stole second, tagged up on a fly out to right to reach third and came home on Lopez’s double to left-center to cap the BayStars’ scoring. Valdes (0-2) yielded four runs and seven hits in six innings of the loss. He struck out five and walked two. At Hiroshima’s Mazda Stadium, former New York Yankee right-hander Hiroki Kuroda (3-1) tossed three-run ball over six effective innings against Shintaro Fujinami (1-2), and Takayoshi Noma and Tsubasa Aizawa both drove in three runs as Hiroshima romped over Hanshin. At Tokyo’s Jingu Stadium, left-hander Masanori Ishikawa (2-2) scattered nine hits en route to his first shutout of the season and Yasushi Iihara drove in three runs in Tokyo Yakult’s whitewash of Yomiuri. Rookie Kazuto Taguchi (1-2) was roughed up for five runs in four innings. At Fukuoka’s Yafuoku Dome, Takeya Nakamura hit a game-tying two-run homer off Tadashi Settsu (2-3) in the sixth inning and gave his team the lead with a two-run double in the seventh as Seibu held off Fukuoka Softbank. Ryoma Nogami (3-1) yielded two runs in 6-1/3 innings for the win. At Sapporo Dome, Orix rallied in a four-run seventh inning, featuring pinch hitter Naotaka Takehara’s three-run shot as the Buffaloes routed Hokkaido Nippon Ham for their sixth win in seven games. At Sendai’s Kobo Stadium, Alfredo Despaigne delivered a go-ahead three-run drive off Takahiro Norimoto (1-3) in the third inning as Chiba Lotte battled past Tohoku Rakuten to snap a four-game skid.